Welcome to WILLIAM SMITH’S MAPS – Interactive. This website has been generously funded by a grant from the UK Onshore Geophysical Library (UKOGL). The website is a free-to-all educational resource designed for teachers and students as well as academicians and anybody with an interest in the life and work of William Smith. The digital images of maps used in this website have been provided by a number of universities and institutions. The National Museum of Wales made images of the William Smith “Y” and “100” Maps available. The “34” Map was from Stanford University (Branner Library), the “P” Map from Nottingham University and the newly re-discovered “A” Map from The Geological Society. The Geological Society also provided images of the 21 published Smith County Geological Maps and Oxford University Museum of Natural History provided all their manuscript versions of unfinished Smith County Maps. A number of individuals have also contributed material to the project. Hugh Torrens provided the 1829 John Cary Map of Somerset with engraved geological lines by William Smith. Dave Williams (HOGG) provided an 1828 copy of Smith’s New Geological Map of England and Wales, with the Inland Navigations. Various copies of John Cary’s New County maps and Cary’s New Map of England & Wales, with part of Scotland, came from John Henry (HOGG) and me. 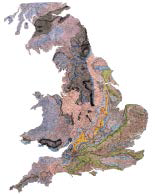 Smith’s Geological sections are courtesy of The Geological Society. Hugh Torrens provided most of the textual content for the Smith Biography section and his encyclopedic knowledge of the life and times of William Smith was an invaluable help to the editor. Tom Sharpe wrote the section on the Map Sources used in the project. Dave Williams has contributed to the Stratigraphy section and also made available material from John Morton’s Natural History of Northamptonshire and a number of plates from William Smith’s Strata Identified by Organized Fossils. The WILLIAM SMITH’S MAPS – Interactive Online Team is extremely grateful to all the data providers. I would also like to express my own thanks to all members of the Online Team for their efforts in bringing this project to completion and also for the help and assistance given by John Henry, Chris Morgan, May Dickson, Caroline Wigley and Kate Maroney. Finally, I would like to thank Dr Malcolm Butler (UKOGL Chairman), the UKOGL Board of Trustees and their technology partner, Lynx Information Systems Ltd for making this project possible.